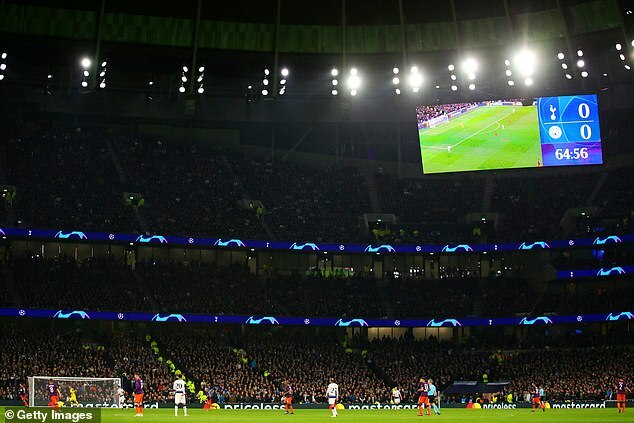 ‘It was an amazing night on Tuesday and an intense atmosphere which undoubtedly played its role in the team’s success in the first leg of our Champions League quarter-final against Manchester City,’ a note from the club to supporters read. ‘However, it is important that everyone is able to see the match and enjoy it. ‘We appreciate that fans will rise up at key moments in the match. Persistently standing for the whole match or for long periods, along with failing to heed requests from the stewards and fellow fans to be seated, is not acceptable behaviour, notwithstanding it’s against ground regulations. Spurs have made a perfect start to life in their new stadium, recording a 2-0 win over Crystal Palace in its opening game followed by a 1-0 victory over City thanks to Heung-Min Son’s goal.